Most of us using Google Reader subscribed to RSS feeds online or offline ,but maybe you will not notice that Google already created a mobile version for Google Reader.Now we all changing to wide LCD screen and most of the web pages are most supported to the width of 1024 pixels,we can added Google reader (mobile version) into Firefox sidebar ,then we can access internet and reading RSS feeds at the same time,no need switch between window or tab. 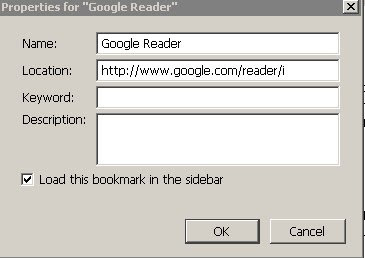 3.Enter ‘http;//www.google.com/reader/i‘ into ‘Location’ column and putting a check into ‘load this bookmarks into sidebar’,then click ‘OK’ . 4.Next time if you click for this bookmark,Google Reader will create at Firefox sidebar . Google Reader ( Mobile version ) will showing 15 articles for you,click option ‘Load more items‘ hyperlink at the end of the page willing display more than 15 articles to you. 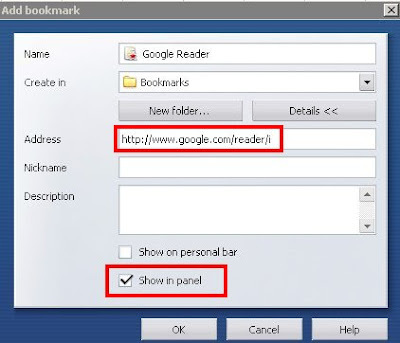 The above tip can be used for Opera web browser.Select ‘Bookmark’ in opera window,then click ‘manage bookmark’ –>’Add’,then type in data as below and click ‘OK’ . Press ‘F4’ to pop up a window panel,then selected Google reader,the Google reader (Mobile version) will appear in Opera sidebar. Pop Up Picture In Microsoft Excel,How To ?